Let’s take it all the way back to last summer, when it was balmy outside and walking around without a coat was the norm (it always seems so distant when it’s the winter!). In Milwaukee, we are notorious for having a festival every weekend between Memorial Day and Labor, whether it be a huge music festival or a festival to celebrate all the different cultures that collide here, we’ve got it all! One of the most fun festivals we have here is the Bastille Days, which take place downtown in the square and brings all the best food vendors together to serve up things like crepes, beignets, and the best/crispiest waffles I’ve quite possibly, ever had. Last year, I ended up going to Bastille Days with my friend Karin, who while also being a pretty awesome girl, shares a deep love of food with me. Case in point, we ended up making a game plan on our walk over to the festival, sussing out the alternating of salty and sweet treats, while also making sure to hit up a nearby restaurant for French 75s in between. One of the things on her list that she had tried before and knew I had to too, was a waffle stand. I was kind of like ‘meh waffles? 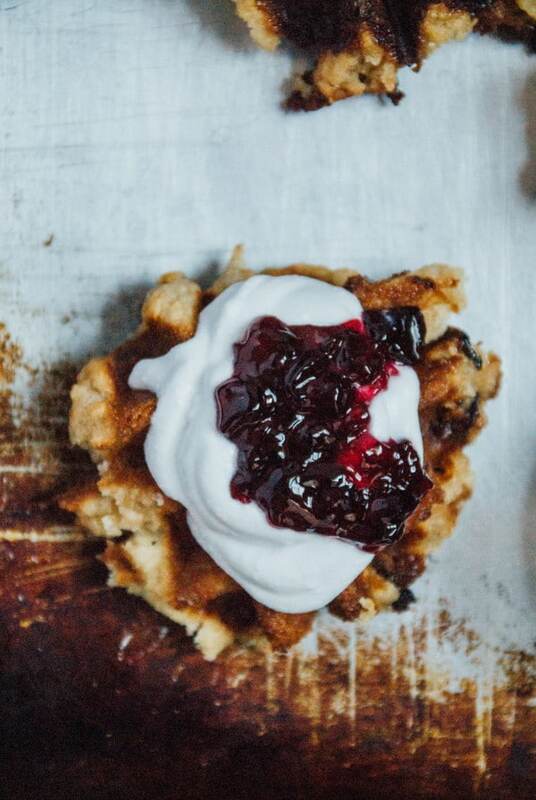 I can make those at home!’, but as soon as I tasted the first bite of the crispy waffle topped with lemon curd and berries, I loudly proclaimed ‘this is one of the top 5 things I’ve ever eaten!’, before scarfing the rest down in record time. 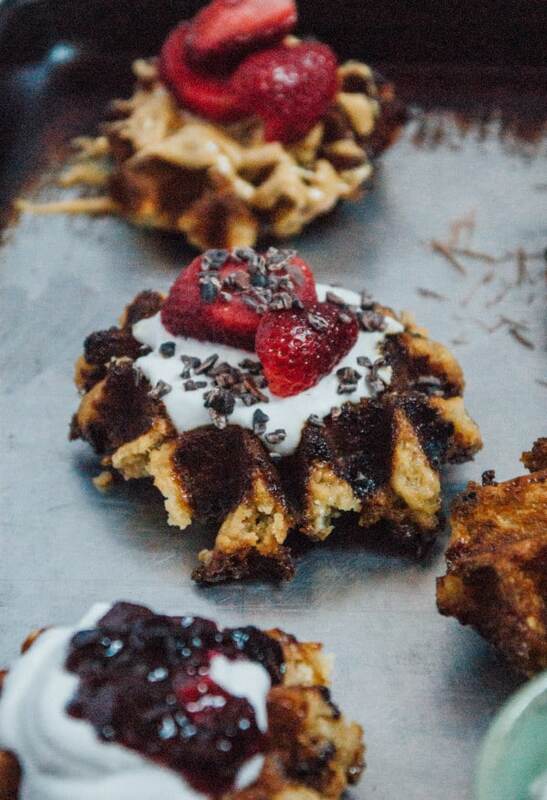 That all being said, I knew I had to recreated these brioche waffles and make them into vegan brioche waffles, partly so I could have them anytime I wanted! 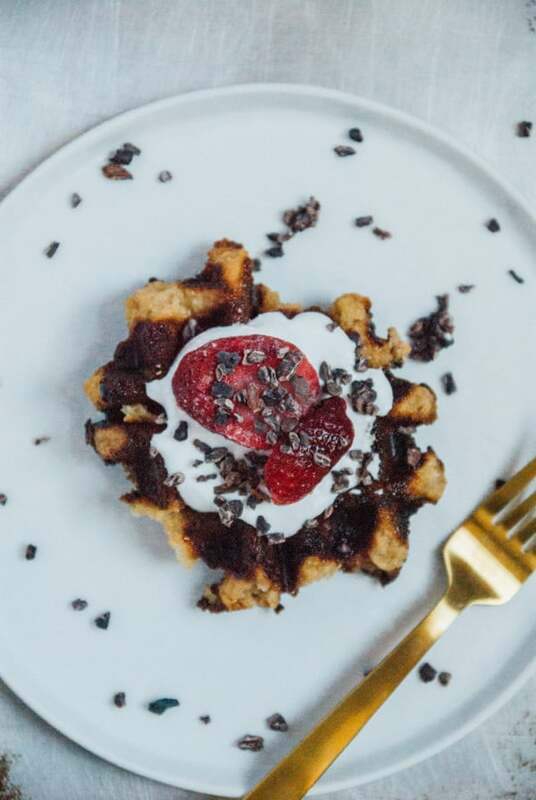 I also knew I wasn’t going to be able to track the waffle stand down, so I needed this vegan brioche waffle recipe, in case of emergency, you know? After tinkering with a few yeast raised waffle recipes and accidentally letting my batter rise in a cold kitchen overnight (whoops), I finally hit the perfect waffle. 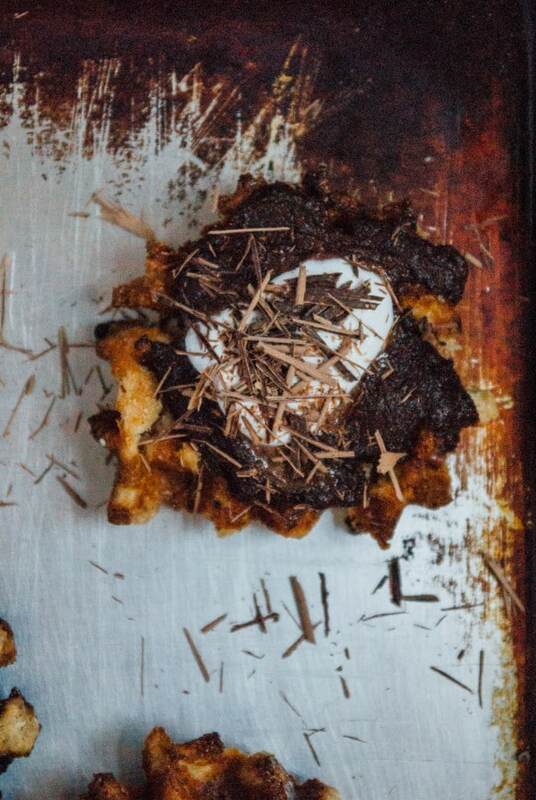 One of the biggest qualities of vegan brioche waffles that set them apart, is that the dough is mixed together the day before and they have the most amazing caramelized sugary crust on the outside that really can’t be matched by regular waffles. I know this version is a bit sweeter than your normal waffles for breakfast, but I’ve found that pairing them with a green smoothie and topping them with fruit always kind of makes me feel better about the whole eating-breakfast-for-dessert thing. 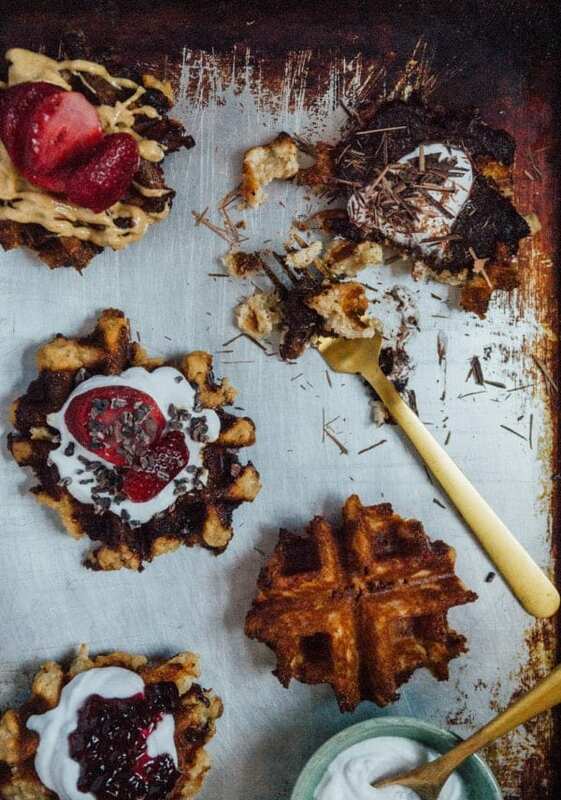 Or you could just eat a waffle for dessert, that’s cool too. In a small bowl, whisk together the coconut milk, water, yeast and sugar. Set aside for 5-7 minutes, until mixture becomes foamy. After the mixture has become foamy, whisk in the cornstarch + water mixture and vanilla extract. Set aside. In a large bowl, whisk together the salt, all purpose flour and whole wheat flour. With a wooden spoon or spatula, mix in the yeast mixture, coconut oil and 3/4 cup cane sugar. Cover the bowl with plastic wrap and let the dough rise at room temperature for 2 hours. Move the dough to the refrigerator and allow to rise overnight. Cook the waffles: Heat your waffle iron on medium heat, then grease liberally. Cook the waffles by scooping 1/4-1/3 cup of batter into the iron and cooking for about 3-4 minutes, until golden brown. Top with nutella, fruit or whipped coconut cream. Yay! A crispy waffle! We will be making these! Get dad to make these for you! I have to get the waffle iron! It’s worth buying, right? I have to justify it to my husband who thinks I have too many things, especially in the kitchen (I agree, but I’m just not a born minimalist!). Love everything brioche…and you managed to veganize it? Amazing! I didn’t realize you live in Milwaukee..I’m a fellow Midwestern! I love how crispy-crunchy these look. And it sounds like I need to go to that festival with you sometime!! Lovely dessert recipe. Can wait to prepare it! Ooooh baby. Tell me there’s a way to make these gf. I must experiment! I love how food can surprise us like that.. when something seems so ordinary, yet it’s been taken to extraordinary by someone who saw a need! 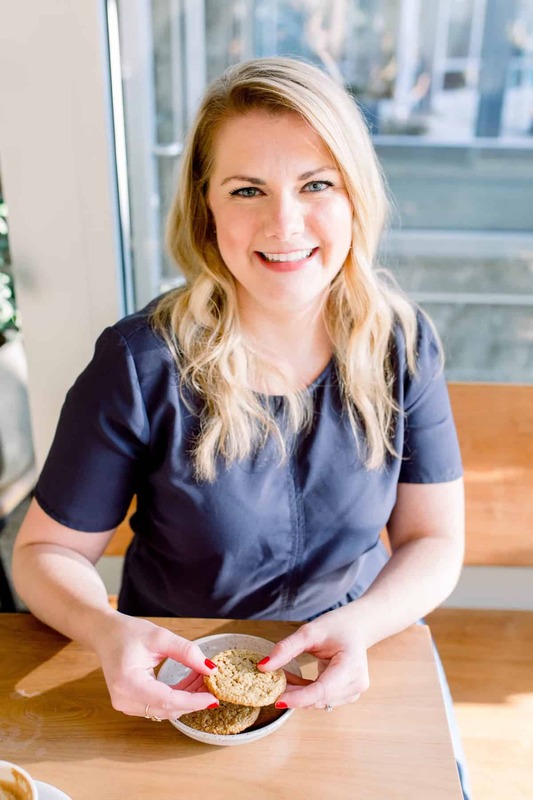 What a fun time with a foodie friend Abby! ANd look, you recreated it.. so worth the time and effort! 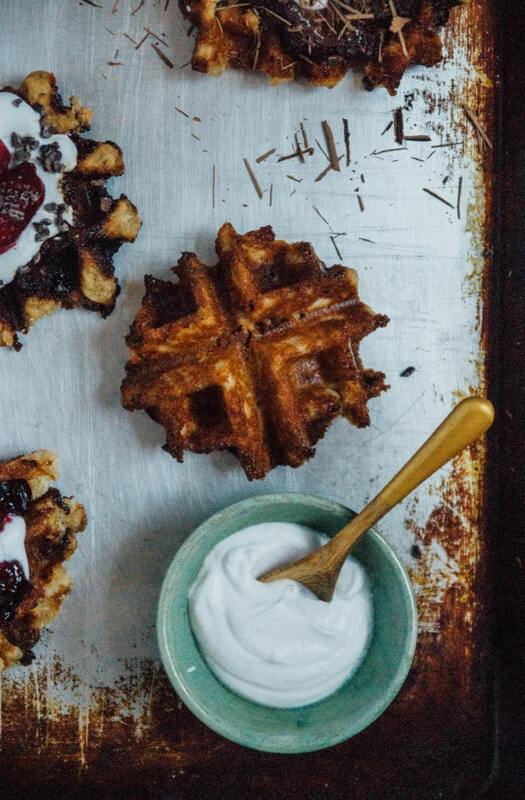 I can totally see how crispy these are and there’s nothing like a good morning crispy waffle! SO fabulous! Dessert or breakfast – I love it when that happens! Agreed Traci! 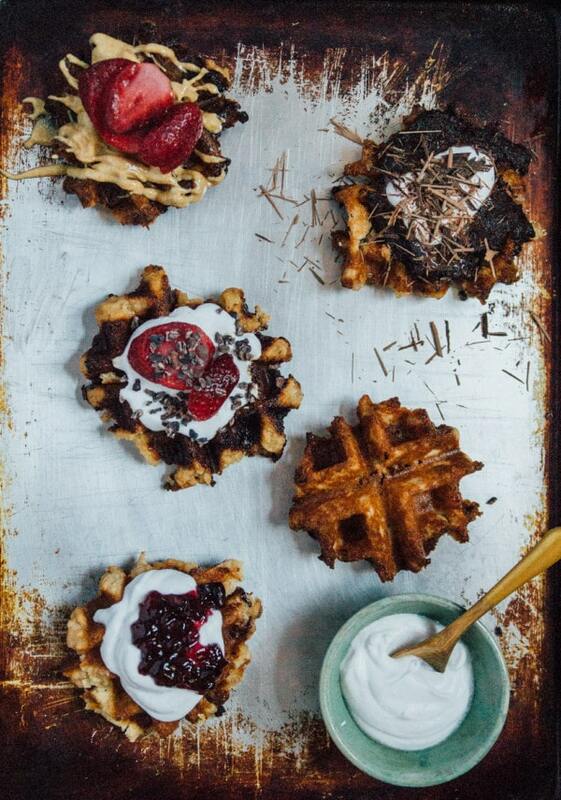 There’s nothing like a crispy waffle and breakfast date with a friend!